The high sanctuary is illuminated from above, drawing parishioners into its warm glow. Credit: Image courtesy Landry & Landry. Students and parishioners reach the chapel by walking a winding path through the campus. The Landrys collaborated with many artists and craftsmen to complete the chapel. The chandeliers are the work of San Antonio-based Isaac Maxwell. The heart of the chapel is the round sanctuary, set off center from the narthex and tabernacle. To learn more about the Oral History of Texas Architecture Project, join Jane Landry, FAIA, Lisa Lamkin, AIA, Alan Mason, and Kathryn Holliday, PhD at the TxA Convention on Thursday, November 5 between 11:30 and 12:30. 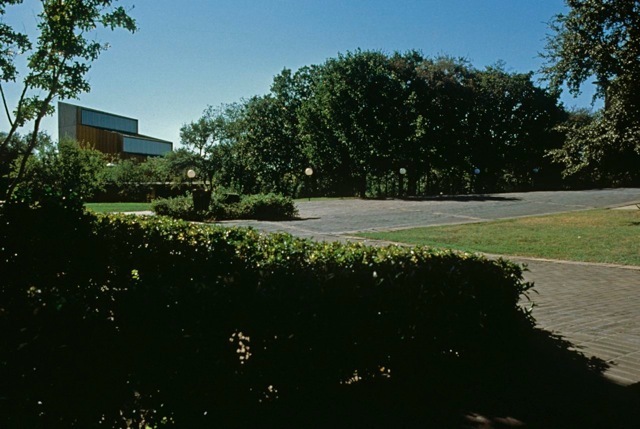 North Texas is home to a handful of chapels on campuses. There are traditional chapels, like the neo-Georgian Robert Carr Chapel at TCU and Perkins Chapel at SMU, and the humble Carpenter Gothic Polytechnic United Methodist Church that serves the Texas Wesleyan campus. More adventurous is O’Neil Ford’s parabolic vault at the Little Chapel in the Woods at Texas Woman’s University and the inspired minimalism of Cunningham Architects' Cistercian Chapel. 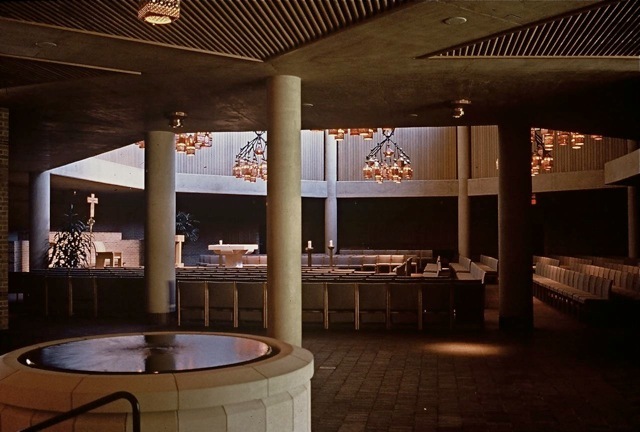 But you have to go to Jane and Duane Landry’s Chapel (now Church) of the Incarnation on the University of Dallas campus in Irving to find something more fully off the beaten path. 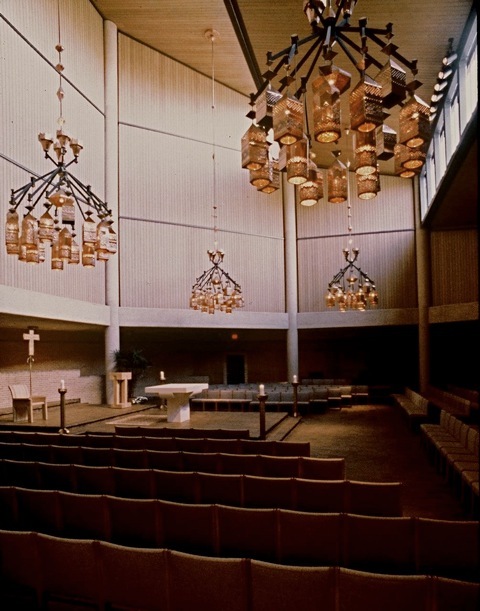 When they designed the chapel in the early 1980s, the Landrys worked closely with University of Dallas chaplain Don Fischer, who joined them in seeking a space that would embody the “numinous” and represent both the closeness of the small Catholic university community and the idea of a spiritual journey. Of all the campus chapels in north Texas, it most fully embraces abstraction and breaks away from traditional worship spaces, creating a humble and warmly contemplative sanctuary from the outside world. The chapel and its copper clad sanctuary nestle in the steep terrain of the campus, drawing worshippers on foot through the campus and groves of trees into a winding pathway through the low porch, past the baptismal font, and around the curving ambulatory. At the chapel’s heart, sunlight illuminates the stepped wood ceiling, shining through the high clerestory windows and reflecting off of the punched copper chandeliers above. The Landrys worked for many years with O’Neil Ford, whose firm designed the central mall of the UD campus, and their shared love of craft and collaboration shows in the chapel’s fixtures and furniture. As the recipient of AIA Dallas' 25 Year Award in Spring 2015, the chapel is a testament to power of architecture to shape and nurture spiritual experience. The Landrys have practiced architecture together since they met in the architecture program in Austin in the 1950s and they are the first architecture couple to respond to their nomination to the AIA’s College of Fellows with a single joint application to fellowship back in 1988. Their story is a shared story, and the passages below are excerpted and adapted from their interview with the Oral History of Texas Architecture Project at the University of Texas at Arlington, a project sponsored by the David Dillon Center for Texas Architecture. Jane Landry: The most important thing for the new university chapel would be that the community wanted to [gather] together around the altar. They came out of a much smaller worship space that was a lecture hall really. But they had worshipped there for some 10 years. It was very intimate. In the community there was even concern about building a new and larger space, that they might lose this. So that encouraged the gathering effect of the round space. Duane Landry: Round spaces are traditional in the Catholic church, but not the main tradition, probably. The oldest church in Rome is round, Santo Stefano Rotunda. Church of the Holy Sepulchre is round. The Baptistery of St. John Lateran is octagonal. And, actually, St. Peter’s and St. Paul’s (that’s Anglican, of course) are domed spaces and round. 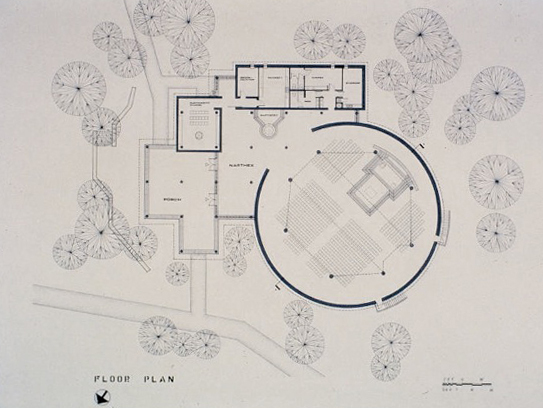 It’s always been a difficult form to work with because the important spot in a round church is the middle. The middle is a bad place to put an altar because you’ve got a lot of people behind it and that doesn’t work very well in a Catholic church. In this chapel, stepping the ceiling and the clerestory windows upward allows you to use a round space, yet locate the altar off center. You know how people gather in a field – they won’t go behind the speaker, but they’ll gather close in on the sides and slightly behind the speaker and then as you get more and more frontal they go farther and further away. That’s the way they’re seated here. Jane Landry: Well we knew that we wanted it to have a gentle kind of light, not a glaring light. We wanted it to have – if you could have great candelabras surrounding you, what would it feel like? Having been to an evening Mass in Florence in the Duomo once, when the church was practically dark except for candelabra that stood on the floor and surrounded us, [we wanted to] turn that image upside down and get that feeling of this light being alive and filling the room. The light fixtures are the work of Isaac Maxwell who was an architect in San Antonio whom we knew from our earliest days there with O’Neil Ford. We went down to San Antonio with the pastor, Monsignor Don Fisher, to Isaac’s house and he had an old house near the King William area and in the foyer of the house, which was two story, he had one of these fixtures hung. That was the first time I ever saw it. And I thought, oh my goodness, it’s enormous. Will it work? But he was right on with the scale. They had to be big. Jane Landry: The process of designing the chapel was collaborative. We involved the university art department widely in making things. Professor Lyle Novinsky of the art department designed the furnishings, the altar, the ambo, and the chairs. Juergen Strunck did a beautiful print, a graphic that is always displayed at Easter. Kind of a water image, blues and greens. The location by the font does have a changing of seasonal expression. Heri Bartsch, who was head of the sculpture department did St. Michael, the crucifix, and the stations of the cross. The stations of the cross were designed to fit into the brick pattern without cutting any of the brick. So, if you’d made a traditional cross, you would have cut into the brick. This way, the designer, Heri Bartsch, did a beautiful job… on the stations. And this is one of our hopes, that this ambulatory will be somehow be restored to its intention of clearly being a path way that follows the way of the cross, that encircles the worship space. Duane Landry: Do you know what the term numinous means? Numinous means filled with the sense of the presence of God. And that’s something you would always strive for in a church. It is something you can’t really get a handle on, you know. It’s something you hope you are able to do. But you don’t know until you see it and you don’t know until you see how people react to it. It’s been wonderful for us to see how frequently, how the liturgy – it’s crowded. People are here every day. During the day students will come in, they’ll come in the space with the tabernacle. Professors come in here in the dark – the lights are off ordinarily – and just sit. And I think that’s been very moving to us and I think it’s one of the things you strive for and you never really know. 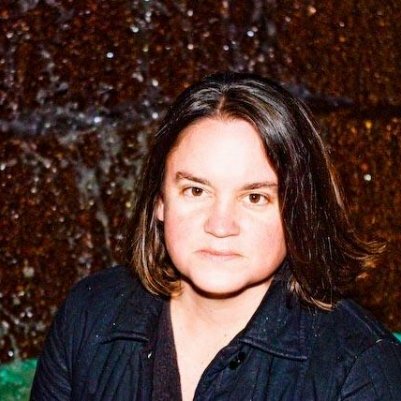 Jane Landry: I’m glad you brought that word up because in the written program the building committee used the word “numinous” – they wanted the space to be numinous. I had never heard the word. So I had to look up the meaning of numinous even though we had talked about the whole thing, all these qualities, we had never used that word until then.